>> The 21 Day SUPER SHRED! 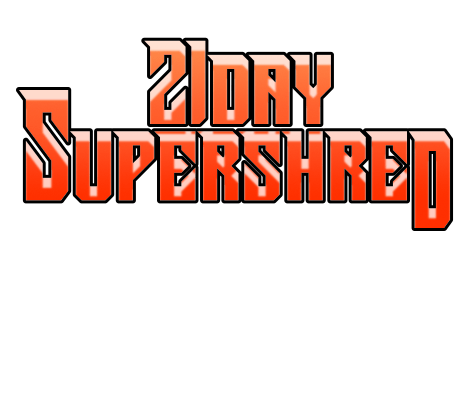 What is the 21-Day SuperShred Program, you ask? It’s a combination of working out in short bursts of high intensity exercises now with STRENGTH TRAINING and balancing your eating habits for a faster and easier way to burn fat and inches off your bodies in only 21 days. Guaranteed. There are NO GIMMICKS and this is NOT A DIET. Working with my clients recently, I have discovered the key to sustained weight loss success. It’s a tried and true formula to help people just like you shed unwanted pounds and get the lean body you’ve always wanted. I haven’t even told you the best part yet! The entire program only lasts 21 days and the results, YOUR RESULTS, will be so AMAZING that you will wonder why you didn’t try this years ago! Space is limited and I can only offer this program to those of you who are ready and willing to make a difference today. Are you ready to dedicate the next 21 days to burning as much fat as you can? There are literally thousands of diet and exercise programs out there that only work for a handful of people. Trust me. I’ve seen enough of them to know that guarantees of results cannot be promised. Until now. The 21-Day SuperShred Program works and the results speak for themselves. Don’t miss your chance. Reserve your spot today!